Security Sustainability event lead by members from the London Water Research Group, EMG attended a workshop convened by Tony Allan on Tony Allan on Water Insecurity, professor at Kings College London (KCL), Martin Keulertz, Tony Colman (UAE), David Dent, Mark Mulligan and Brendan Bromwich (KCL), at the Geography department of Kings College, London, to discuss the challenges and opportunities of achieving water and food security and sustainability. Attended by academics and scientists from some of the UK’s leading universities and professionals from organizations including the WWF, the Carbon Disclosure Program (CPD), the Environment Agency, Overseas Development Institute (ODI) and Global Garden, the workshop followed an interesting trajectory that brought attention to the issues at the crux of the food-energy-water ‘nexus’. Of particular prominence to the discussion was the role of agriculture and its supply chain – a sector of global importance and magnitude that is responsible for 30% of the world’s energy use. Tony Reynolds, a UK farmer practicing conservation agriculture (CA) provided a fascinating insight into the methodology behind CA techniques and most interestingly, presented figures that demonstrated the commercial viability of such methods when stacked against current, intensive methods. Able to produce an extensive yield at a competitive price, CA presents a method that not only minimises or eliminates the use of phosphorus, potassium and other fertilizers, but sees up to a 50% reduction in energy (fossil fuels) for machinery, lower water usage and higher quality soils. Building on this, Tony Colman, in discussing the need for getting water and food security on the public agenda, drew attention to future policy which may see farmers required to increase the carbon content of their soils through such conservation methods, to increase the integrity of global soils and in doing so, mitigate some of the effects of global climate change. Many challenges existing in solving the problem of the nexus, that is, managing each entity – food, water and energy – in a way that is not detrimental to the other, lie in accounting and financing. It was interesting to hear Mark Mulligan speak on the great opportunities that lie in measuring our resource use, offering the example of using consumer equipment to build weather stations to ensure extensive and detailed geographical coverage in a commercially viable way. At the corporate level, the need for accounting and reporting is increasingly necessary for companies to not only keep track of and better manage their resource use, but to help contribute to a national and global picture of the nexus. With COP22 already planned for November 2016 and a number of other climate-related conferences scheduled for the New Year, it really is the time for companies to invest in sustainable and responsible behaviours and reporting practices. EMG would like to thank Professor Allan for leading the workshop and for inviting EMG to take part. 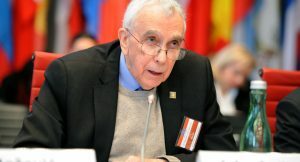 To read our in-depth thought leadership interview with Professor Allan on water insecurity in the Middle East, see here: http://www.emg-csr.com/blog/water-insecurity/.